Wadhurst Dramatic Club – Page 2 – Young or Old, Have Fun, Be Bold! A huge “Well Done” to the Platinum Review performers and crew. It was a fabulous show, and so many of the audience said lovely things in praise. Some even said it was the best thing they had seen at the commem. Hopefully we can post some photos and video soon. Website Outage Apology – If you had recently tried to access this web site, you would have noticed that it showed a horrible error message. As you can see, this has finally been resolved. Lets hope it does no happen again! Comments Off on WOW Pops the Power! The very first show of Way out West.. in a dress (WOW for short) was not only hilarious, it tripped the power to the Commem! It seems that a faulty strip light in the ladies loo was to blame. Click the following link, where everything stops during the opening song.. Welcome to the Lucky Lady.. power fail! 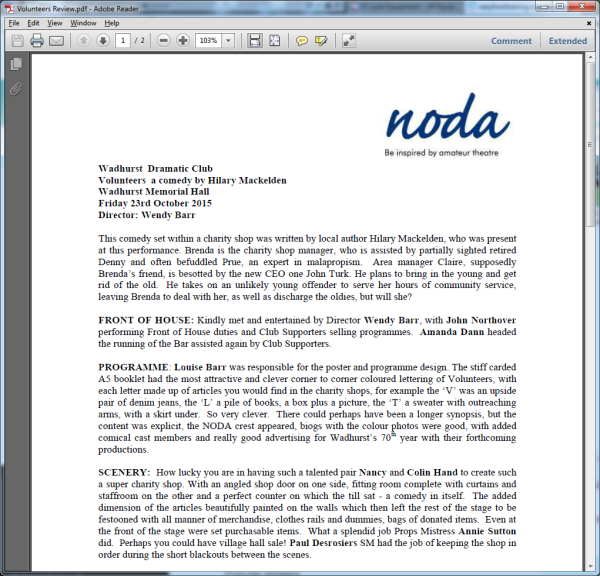 And here is the Noda Review of the show..
Wadhurst Dramatic Club is 70 years old this year! To celebrate we are looking for singers, dancers, actors, stand-up comics, magicians, instrumentalists, bands, entertainers, monologue performers story tellers and jugglers. …If you have been waiting for the chance to bring your ventriloquism act to the stage – this could be it!! If you’d like to take part, either email Russ on russ.kirton@zestica.org.uk or pop into the Commemoration Hall on Sunday 7th February 2pm till 5pm and let us know what you can bring to the party! If you can give us a flavour of your act on the day, so much the better. Everyone is welcome so please share this open invitation to be part of the 70th birthday party with a difference – platinum with attitude! Comments Off on Volunteers – NODA review. Thanks to NODA (National Operatic and Drama Association) for a great review of our latest production, Volunteers by local author Hilary Mackelden. Click the image below to open the full review in Adobe Acrobat. Comments Off on Fig Leaves looking great! 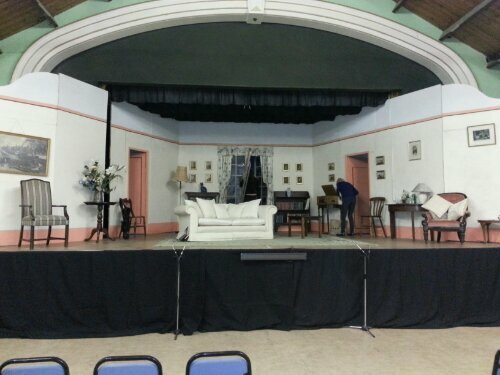 We popped into the final dress rehearsals last night, stage looks fantastic as always (great work crew) and the play is really comical. Some brilliant characters and parts, story worked very well too. Tickets are still available online from the Box Office, or in person from Southern Cross Travel in Wadhurst high street. Come along, support the community, enjoy some drinks & eats and have a great night out to boot! It’s all over for now!! What laughs we had – Widow Twankey’s skirt, all those custard pies, skeletons in the closet. Hopefully, the audience enjoyed it as much as we did. Thanks to everyone who contributed in so many different ways – see you in May!! If you’d like to be involved, get in contact, we always love new faces, new ideas, new talent, new pairs of hands!!! Comments Off on Blackadder goes on stage!! Excellent first week’s run of Blackadder II – Beer, Potato & Head elicited lots of giggles and guffaws on Thurs, Fri and Sat this week. A few minor hiccups just added to the general glee. Come and brighten a dark Feb evening this week with Queenie, Percy, Baldrick, Melchett and Blackadder himself. Tickets only £10 including scrummy food served to you with a smile (usually). Buy online for Thurs 3rd, Fri 4th or Sat 5th Feb or call in at Carillon Cottage. Alternatively you can ring Juliet on 01580 201883. Don’t miss it!!!!! Comments Off on Production Approaches ! Only a few weeks to go now and things are going great. Rehearsals continued over the Christmas period and both cast and crew are getting excited. Costumes are well underway and we’re all looking forward to moving into the Commemoration Hall for rehearsals so we can start treading the boards on the stage! Posters are out and tickets are selling well. No time for nerves yet! Good read thro’ last night – a little bevy of potential new performers turned up and were really good, which made it more fun. Lots of laughs just reading thro’ ‘Head’ & ‘Potato’. Hope to see lots of potential Blackadders on Saturday at the auditions at the Methodist from 10am onwards …. and Percys …and Queenies…and Melchetts…and, of course, Baldricks. Come and have a giggle! We’re planning to meet up and talk scarecrows tomorrow morning at Catherine’s house around 10.30am. Any help very welcome – we’ve got some ideas, but need to translate them into reality. Leave a message if you need to know where to come.